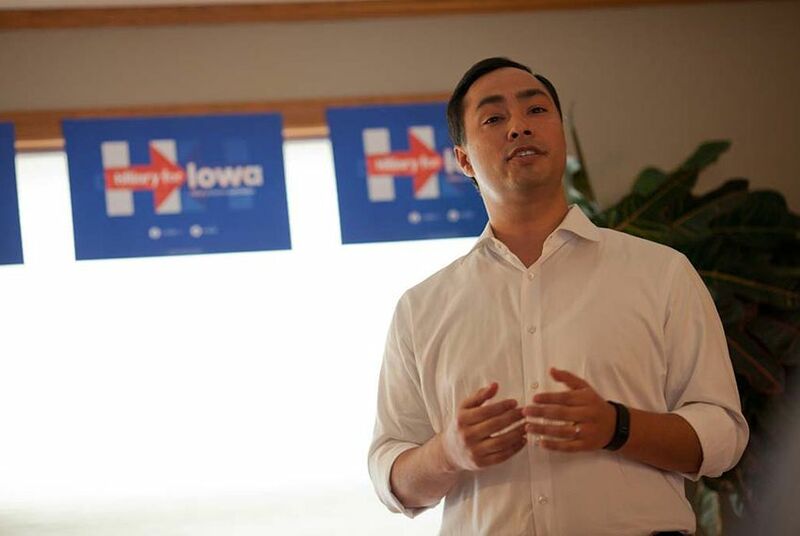 While the political world waits to see if Hillary Clinton selects U.S. Secretary of Housing and Urban Development Julián Castro as her running mate, U.S. Rep. Joaquin Castro could remain a force in Congress regardless of the outcome. WASHINGTON — As U.S. Rep. Joaquin Castro makes his way around Washington, a rather unique nickname trails him: "The Other Twin." That's what happens when your brother is in serious contention to be U.S. Secretary of State Hillary Clinton’s running mate. After more than a year of speculation, Clinton is days away from announcing her decision. “It’s been an intense period,” Joaquin Castro, a San Antonio Democrat, said in a recent interview with the Tribune. “I think Julián will do well, whatever happens. He’s got a very bright future ahead." 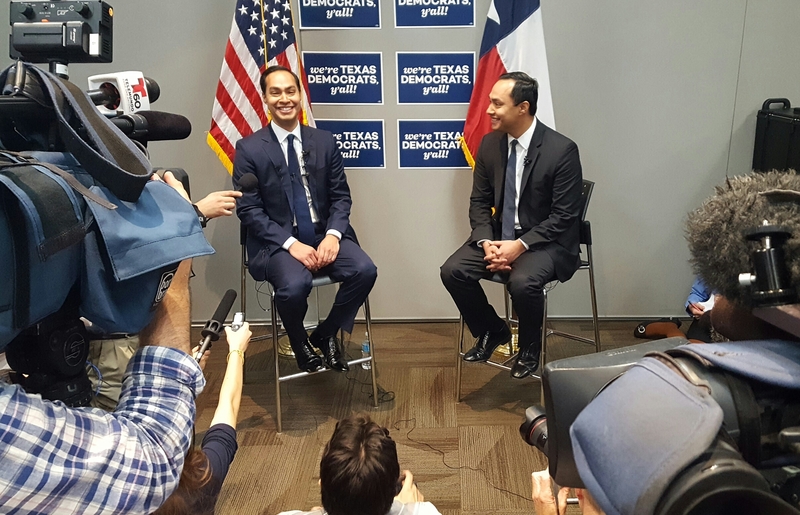 U.S. Secretary of Housing and Urban Development Julián Castro has been the better-known twin ever since his 2012 Democratic National Convention keynote speech, and as a result Joaquin Castro is often conflated with, if not outright overshadowed by, his brother in national politics. If Clinton taps Julián Castro to be her vice-presidential candidate, the lives of both Castro brothers will be forever changed. Yet if she doesn't, Joaquin Castro could very well overtake his brother's prominence in a few years. Despite being the less-famous Castro brother, Capitol Hill Democrats see an untested man with political potential, and perhaps someone poised to challenge U.S. Sen. Ted Cruz's re-election bid in 2018. Though there are significant doubts that Clinton will choose Julián Castro, her consideration of him as a would-be vice president puts Joaquin Castro in a unique perch. For the first time since U.S. Sen. Edward Kennedy was elected to the Senate during his brother’s presidential administration more than 50 years ago, there could be two brothers serving as elected officials in two separate branches of the federal government. However, sources close to the Clinton campaign’s inner circle suspect that Julián Castro is a long shot, at best. The safer money is on a Democrat with more experience, like U.S. Sen. Tim Kaine of Virginia or Agriculture Secretary Tom Vilsack. Read More Is Julián Castro Experienced Enough To Be VP? Given that the Castro twins mirror each other not just in appearance but also in education and political interests, many wonder how Julián emerged as the contender for national office. To Joaquin Castro, this isn't a mystery. His brother was mayor of San Antonio, while he served for 10 years in the Texas House before joining Congress in 2013. “It’s because you’re in a more visible, independent executive role,” Joaquin Castro said of the dynamic. While Julián Castro’s fortunes rest with Hillary Clinton, Joaquin’s future mostly rests with another woman: Nancy Pelosi. It is nearly impossible to overstate the power with which the House Democratic minority leader wields within her caucus. Back during his first term in 2014, Castro was a finalist to run the House campaign arm, the Democratic Congressional Campaign Committee. Pelosi alone selects the chairman, one of the most grueling and thankless assignments in politics. It is a two-year — and often four-year — commitment of recruiting, nurturing and fundraising for House Democratic candidates in competitive districts across the country. Castro made his case for the job just days after the Democrats suffered losses in the 2014 midterms. But Pelosi passed over the freshman from Texas in favor of a more seasoned Democrat, U.S. Rep. Ben Ray Luján of New Mexico. In this role, Castro works the House floor to count votes but also to relay to leadership the pulse of members he is assigned to monitor, mostly Hispanics. With this title, the party also placed higher expectations on his fundraising. As of June, he raised at least $155,000 for the DCCC, according to internal committee records obtained by the Tribune. Earlier this summer Pelosi further added to Castro's burgeoning resume with one of the weightiest assignments in Congress: a seat in the House Permanent Select Committee on Intelligence. Unlike slots on some other committees, “Intel” is not a trinket. Members are only assigned to the committee after demonstrating they are responsible enough to handle sensitive information that could cost American lives. Serving on the committee can also give a member a degree of foreign-policy gravitas that can help fuel future campaigns. Pelosi, a long-time Intelligence member, is known to take particular care with that assignment. According to Democratic sources on Capitol Hill, she sought feedback from her caucus about placing Castro on the committee. But these high-profile considerations and assignments don’t come without some irritation. There’s a private sense among more than a handful of House Democrats that things just seem to come easier for Joaquin Castro than for everyone else. Yet no Democrats contacted for this story was interested in criticizing Joaquin Castro on the record. Most members spend years toiling with crummy committee assignments and ignored by television bookers. But Castro, along with U.S. Rep. Joseph P. Kennedy III, the grandson of the late Robert F. Kennedy, were celebrities before they even arrived to Capitol Hill. For Kennedy, there was a novelty that a Kennedy had returned to Congress. For Castro, the concept of identical twins in politics was unlike anything anyone had ever seen before. His defenders argue against the idea that he passively received stature from doting grownups in the House. He raises money for the party, and despite being a father of two young children, he travels to other members’ districts to make the case for them to Hispanic voters. “He’s never had an opportunity to be tested, but he’s always done what we’ve asked,” said a Capitol Hill leadership aide who was not authorized to speak on the record. His colleagues and Congressional staffers describe him as shy, quiet, smart, funny, diligent, an introvert. A recurring — and somewhat unusual for D.C. — commentary is that he “stays out of the drama" within the caucus, meaning he’s navigated competing factions and rivalries without overtly alienating any of the major power players. A staffer from outside the delegation pointed to tactical staffing for Castro’s early success. While some freshman bring to Washington loyalists from their previous careers, Castro chose a seasoned Congressional veteran, Carlos Sanchez, to serve as his chief of staff. Sanchez, a native of Laredo, is a longtime known quantity on the Hill and previously worked for Pelosi. Multiple sources say his deep institutional knowledge of the leadership and the intra-personal politics among Democratic House members helped Castro navigate the lower chamber's tricky terrain. If he's willing to spend a few decades in the House, he is on a trajectory that could lead to a spot in leadership or a committee chairman. But does he want to spend decades in the House? Joaquin Castro is not ruling out a run for the U.S. Senate, and his next opportunity will be in 2018, when Cruz is expected to run for re-election. Despite the chatter, the Cruz camp maintains the senator is in no political danger, but operatives do telegraph anxiety that a stronger-than-usual Democratic challenge could cut into his margin and hobble Cruz if he opts to run again for the White House in 2020. While a Castro run — either Castro — would be a boon to national Democrats, no amount of optimism can change the fact that a Democrat would be the underdog in the race. U.S. Rep. Bill Flores, R-Bryan, couldn't be less concerned about Castro running against Cruz — or any other Republican. "I'm not afraid of him running statewide because Republicans can put up some great candidates," he said. "We already have, and I would think if we put up the right Republicans, we'll defeat any Democrat statewide." Castro has no delusions about the political state of the state. At the same time, his and his brother's status as two of the very few "stars" in their party from Texas presents both an opportunity and a burden. “I feel the responsibility to build the infrastructure for Democrats to come back in Texas,” he said. “There’s got to be a commitment from Democratic voters, officeholders, activists, fundraisers, everybody to build the infrastructure to make us competitive,” he added. “And if we don’t do that, you’re asking for magic from the candidates. He joked that Democrats ought to recruit actor Matthew McConaughey to run a Texas campaign like Arnold Schwarzenegger’s Republican gubernatorial campaigns in Democratic California.